Music giant Sony recently released multi-talent Mumbai-based Assamese singer and composer Ajay Singha’s music album and video, In Rahon Mein. The album features seven vocal numbers sung by famous singers like Meyang Chang, Sriram Iyer, Ash King, Raman Mahadevan, amongst others. 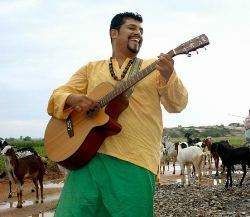 Touted as India’s first on-the-road album, In Rahon Mein, within a short period of time has earned acclaim from critics and veterans in the industry. Based on the recurrent theme of journeys, In Rahon Mein primarily has an acoustic sound. Each song has a different emotional journey, a marked difference from the usual romantic or dance numbers that we get to hear. The USP of the album is the intricate orchestration of each number with multiple instruments and each coming out with its unique sound and blending with the vocals. 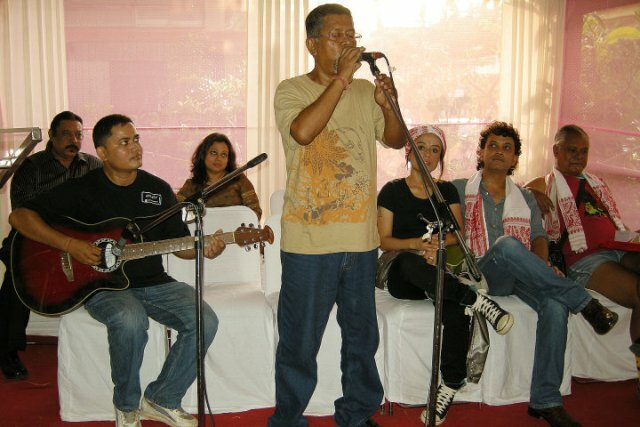 Besides Ajay Singha, who is popularly known as Miko in the music circles, In Rahon Mein also features many other well known Assamese artistes like Kalyan Barua on melodica, Ambar Das on drums, Akashdeep Gogoi on bass guitar, Sunita Bhuyan on violins and Krishna on guitars. A combination of different musical genres, the album has been designed in such a way so as to provide the perfect ambience while driving or in a relaxed environment. Apart from semi-classical, pahadi folk to rock fusion, In Rahon Mein also explores with genres like country, Sufi, pop rock and funk and jazz fusion. The launch of the album was a high profile one as a number of well known musicians and singers came out in huge numbers to attend the event. Eminent singer Kailash Kher gave a fitting tribute to the album and the singer by terming him “a rare combination of multi faceted talent and human sensibilities”. The album listening season also saw the screening of the video of In Rahon Mein. 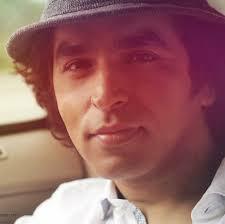 The video features popular TV personality Ruslan Mumtaz. The evening also saw performances by Chang, Ajay Singha, Sriram Iyer, Raman Mahadevan, Mohit Pathak and Trisca Fernandez. Born and brought up in Guwahati, Miko moved to Bombay 12 years back to pursue his passion for music. “Though I have been primarily working in the TV and advertising world, In Rahon Mein is a labour of love and realization of a dream which was born after my last work with Papon, Ik Sapney Mein, a year back,” he says. Ik Sapno Mein, which was composed for Star Plus telefilms Teri Meri Love Stories, had also been widely welcomed and appreciated by listeners and connoisseurs alike. “A collaboration of different musical genres with some of the most soulful voices of the industry, I hope that In Rahon Mein is able to take the listener through a journey of memories,” he added. Before In Rahon mein, Miko has a huge body of work, which he has composed over the last 12 years for top notch channels and performers, to his credit. An accomplished piano player, he has a formal background of learning western classical music with grades from the Royal School of Music, London. Also the first Assamese artist to feature in and have his own VEVO channel, Miko has earlier composed music for some highly popular shows of Colours Television, Star Plus, Sony TV, and the like. The concept of playing live for a virtual audience has finally arrived in India. Webcerts, as these concerts are called, have within a very short space of time become an instant rage amongst the country’s digital audience, primarily because of its ability to bring to life the magic of live performances right in front of your desktop or lappy! The first webcert, which was conceived and organized by popular web portal Artist Aloud a couple of months back, featured Shibani Kashyap as the main act and who was preceded by an opening act of Nakash Sargam. The event was streamed live on the music portal’s website, targeting a global online community of music lovers all over the country and the world. As a concept, webcerts are truly unique. Though live broadcasting or streaming of performances over the net is nothing new, India has till now never seen a complete concert being streamed live into the internet. Besides enabling the performers to reach a much wider range of fans spread over a big area, webcerts have become an instant hit among urban audiences because of the minimum of hassles involved. So if you ever wanted to watch your favourite artiste perform live and did not have the money or time to buy a ticket or brave the journey to the venue, do not worry for there is a much more easier alternative at hand. With webcerts, all you need is a computer and a broadband internet connection! But despite the flexibility of time and space offered by webcerts, lack of infrastructural support might prove to be a major constraint. One can take the instance of Northeast India which, despite having a highly vibrant music industry, lacks the required infrastructure as the internet is yet to fully penetrate into the rural areas. Soumini agrees, “Our biggest hurdle is definitely infrastructural support. However, having said that, our aim is to provide a seamless viewing experience for those who have access to a PC and a good Internet connection,” says Paul. But senior Guwahati-based drummer Ambar Das feels that connectivity shouldn’t be such a big issue as there are “many netizens in the Northeast” which can make for a sizeable audience. At the same time he lays stress on the initial impressions, “This concept can be viable, but only if the first impressions are good and good artists and bands are showcased.” Since the first webcert with Shibani Kashyap, bands like Parikrama have also had their own exclusive digital concerts, playing live in front of thousands of net-goers all over the country. Techno stuff aside, whether these digital performances can manage to strike the emotional chord the same way a live performance can remains a big question mark. According to Oliver Rai, the programme officer of Shilpgram in Guwahati where live performances are held frequently, it is time the regional musicians moved ahead. As he says, “The Northeast is musically advanced. In our experience we believe webcerts will work well, especially because in Northeast India both musicians and music lovers are evolved. There is a lot of talent in the Northeast that needs to be tapped. Concepts like WebCert would help these artists present themselves not only within India but globally and help them build a fan base.” In a region where musicians have long faced discrimination, there is no end to the possibilities. With the independent music industry in the Northeast yet to receive the much needed impetus, webcerts might very well be the answer musicians here are looking for! For the organizers- The cost involved includes bandwidth cost, sound, light, production and camera crew and of course artist fee. For the consumer there is no cost. 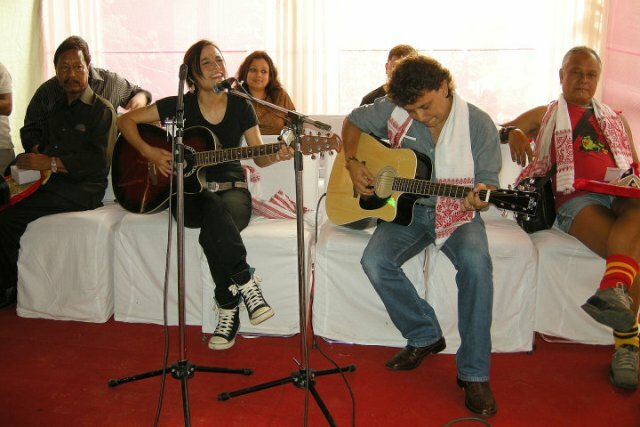 Music lovers of Guwahati recently had the chance to be part of a highly interactive jamming session with some of the most well-known musicians of the region. I am talking about the jamming session organized as part of the inaugural launch ceremony of the DJ School of music in Rajgarh area of the city. The music school has been started by singer-guitarist Dhruva Sharma, who was the frontman of Friends – the oldest rock group of the State. Some of the most prominent musicians of Guwahti and Shillong were in town last Saturday to be part of the official opening ceremony. The guest singers list included Khasi singer-guitarist Lou Majaw, Rudy Wallang and Tipriti of Soulmate, veteran Assamese guitarist Utpal Barsaikia, JP Das, Keith Wallang, amongst others. While Guwahati has always been home to some prolific musicians who are doing very well in their professional careers, the lack of proper music schools have often proved to be a major hindrance for aspiring music students who are often found to lack a proper foundation. As such, a music school which has an experienced western classical music faculty is reason enough for good cheer. The faculty of the DJ school of music has musicians like Bredner Momin (piano), Madhurjya Bordoloi (guitars), Nomoni (drums), Ambar Das (drums) and Proma (piano). Following a simple ceremony where all the musicians were felicitated with gamosas and japis, the guest musicians got down to do what they do best – jam together, of course! – much to the delight of all those present that day. While Rudy and Tips showed those present their musical acumen which has taken their band places all over the world, JP Das and Lou Majaw proved that despite their age they are still going strong. With his deep baritone and the occasional nasal twinge, Lou was at his characteristics best that day. A host of musicians and music lovers of the city had descended at the Rajgarh area to be part of the opening ceremony and it was a sheer trip down memory lane for most of them present.